The first World Fish Migration Day was held on 24th May 2014 with the aim of raising awareness of the issues facing migratory fish species. The next one will take place on 21st May 2016 and we’ll bring you all the details about the upcoming events nearer the time. Who is running World Fish Migration Day? The initiative was undertaken by a group of partners; World Wildlife Fund (NL), The Nature Conservancy, International Union for the Conservation of Nature SSC/WI (Species Survival Commission/Wetlands International) Freshwater Fish Specialist Group, Wanningen Water Consult and LINKit consult. As well as these partners, various other supporters organised events and helped to promote the initiative. Which is how INJAF found out about the project. Why does INJAF support World Fish Migration Day? Our experience of helping out with the ZSL eel monitoring in the Thames in 2013 and 2014, and getting involved in the Hogsmill habitat improvement project, were great opportunities for a bit of hands-on conservation work. It certainly helped bring home the many issues faced by migratory species as man’s influence on the natural environment is felt more and more. So we were delighted when the World Fish Migration Day information popped up in a Facebook link from the Freshwater Fish Specialist Group. Having seen the plight, on our own doorstep, of a once common migratory species we feel very strongly that we should do our bit to help raise awareness of the global situation. It’s not just eels that are having trouble, there are countless species across the world whose migratory routes are being affected by man’s actions. It’s not only the fish that are affected though, many migratory species are food sources for various communities who depend on them, not only for food but often as a source of income in an impoverished area. It’s also important to remember that many species which are easily available in the aquatics hobby are migratory species which raises questions over their suitability for life in a domestic aquarium. One of the six ‘poster fish’ from the Big Fish Campaign, the iridescent shark Pangasianodon hypothalamus is a migratory species. Quite apart from being a tankbuster with a huge potential size, this is a species that expects to be able to migrate around the Mekong Delta, a significantly larger area than a domestic aquarium. The ever popular but often misunderstood clown loach Chromobotia macracanthus migrates for spawning purposes. This species is an important source of income to the communities that provide it to the aquatics trade, any disruption to its migration could easily have significant ramifications for the trade and those communities. World Fish Migration Day comprised a series of events starting in New Zealand, following the sun and ending as the sun sets on the west coast of North America. The project brings global attention to the need for open rivers and free routes for fish migration as well as gaining international press coverage. Eels were firmly on the agenda with ZSL running an Eel Celebration Day, check out the events page on WFMD website to see the huge range of events that took place worldwide. Over 250 events were hosted all over the world, it’s great to see so many people getting involved. The final report from WFMD 2014 is now available to download from their promotional materials page. The report is very positive and emphasises the global aspect of the event. The campaign aims to build on the success of 2014 and several more events are planned. 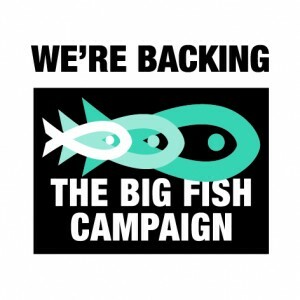 The second World Fish Migration Day is planned for 2016 and we fully intend to be there! Now that the 2014 event has drawn to a close we at INJAF will be gathering some of the articles and information published on the day, and following on from the day, and adding them here to start building up a resource of information on migratory fish and the issues they face. 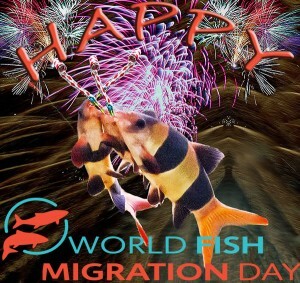 seriouslyfish.com – Support World Fish Migration Day 2014! Don’t forget that you can ‘like’ World Fish Migration Day on Facebook and also ‘follow’ them on Twitter. WFMD is well worth following as there is a huge amount of information available via the Facebook page with links to various projects and international activitiy. Many of the other websites and organisations linked to above also have Facebook and Twitter accounts so make sure to check them out too. We’ve recently added some ‘likes’ to the INJAF Facebook page so you might also like to have a look through them for anything else that takes your interest.